This paper presents the challenges of designing two assembly chambers in the Follo Line Project, EPC TBM. The chambers are required for the assembly works of the four tunnel boring machines, two machines in each chamber. These caverns are situated in hard gneiss with a depth from ground surface around 100 m in the North and 65 m in the South. The features of the assembly chambers indicate a potential failure mode of block instability. Such failure mode is controlled by the geological structures, discontinuities and in-situ stress level. 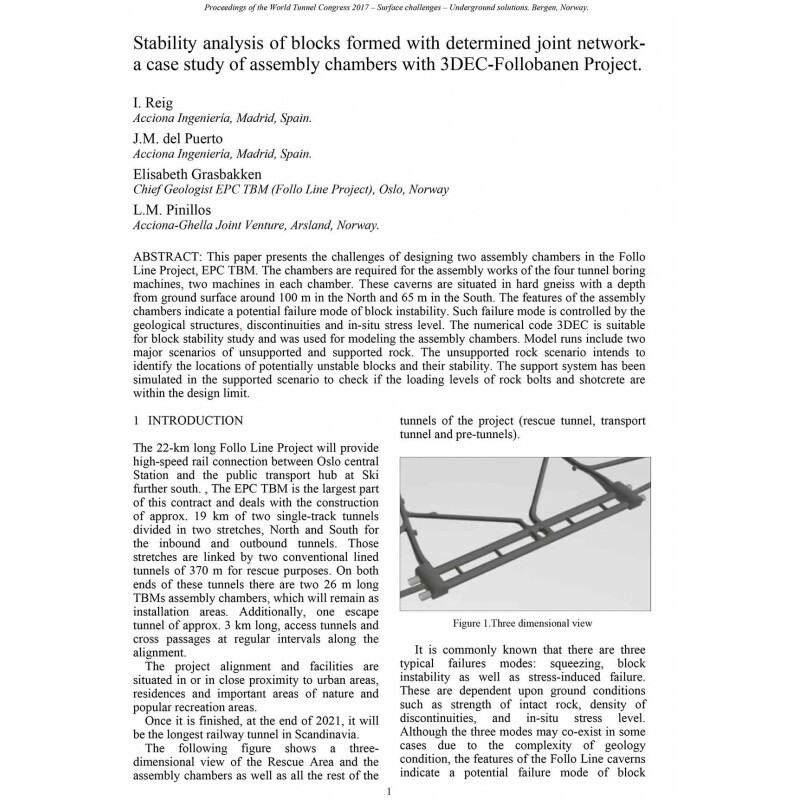 The numerical code 3DEC is suitable for block stability study and was used for modeling the assembly chambers. Model runs include two major scenarios of unsupported and supported rock. The unsupported rock scenario intends to identify the locations of potentially unstable blocks and their stability. The support system has been simulated in the supported scenario to check if the loading levels of rock bolts and shotcrete are within the design limit. 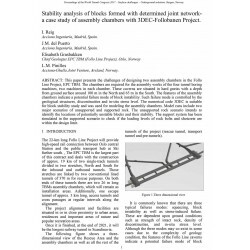 Abstract: This paper presents the challenges of designing two assembly chambers in the Follo Line Project, EPC TBM. The chambers are required for the assembly works of the four tunnel boring machines, two machines in each chamber. These caverns are situated in hard gneiss with a depth from ground surface around 100 m in the North and 65 m in the South. The features of the assembly chambers indicate a potential failure mode of block instability. Such failure mode is controlled by the geological structures, discontinuities and in-situ stress level. The numerical code 3DEC is suitable for block stability study and was used for modeling the assembly chambers. Model runs include two major scenarios of unsupported and supported rock. The unsupported rock scenario intends to identify the locations of potentially unstable blocks and their stability. The support system has been simulated in the supported scenario to check if the loading levels of rock bolts and shotcrete are within the design limit.